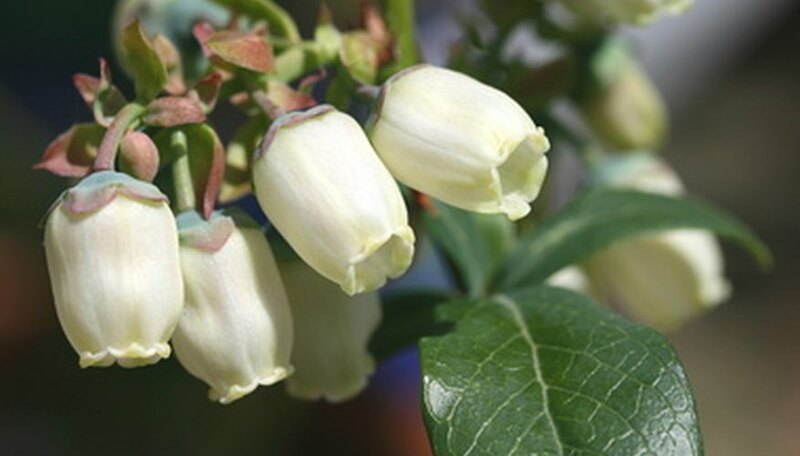 Misty blueberry plants are grown not only for their fruit-producing capabilities but also for their attractive blue-green foliage and pink-to-white flowers. They can grow to between 4 and 6 feet tall, and are known for being a high-yield variety of blueberries. Growing a misty blueberry plant in your garden requires a little preparation and care. Make sure the planting area you choose has good drainage, is free of tree roots and at least 20 feet away from any structures. Work the soil in the planting area by turning the soil over to a depth of approximately 16 to 18 inches. Remove any weeds, rocks or sticks that might be in the planting area. Dig a planting hole that is 18 inches deep by 18 inches wide. Mix into the soil removed from the planting hole 1/4 to 1/2 cubic feet of acid sphagnum peat moss. If you're planting more than one misty blueberry plant, you will need to space each planting hole about 5 feet apart from each other. Remove the misty blueberry plant from its growing container. Lay the container horizontally on the ground. Use a hammer or a trowel and tap along the base of the container to slide the container from the root ball. If the root ball appears to have compacted, or encircled roots, break apart some of the roots using your fingers. Set the misty blueberry plant into the planting hole. It needs to be planted at the same level in the soil it is currently growing at. Add or remove soil from the planting hole, if necessary, until you are sure the misty blueberry plant is sitting at the appropriate level. Scoop in garden soil to fill the planting hole full with soil. Pack the soil down around the misty blueberry plant. Spread a 3- to 4-inch layer of pine bark mulch that is approximately 2 feet in diameter around the misty blueberry plant. Keep the mulch about 1 to 2 inches away from the stem of the misty blueberry plant. Water the misty blueberry plant thoroughly. To help with watering, create a small dam of dirt, about 2 inches high, around the misty blueberry plant. Cut off all the twiggy, branchy growth of the misty blueberry plant. Leave the strongest, hardiest cane/branch. According to the University of Florida, the best time of year to plant blueberries is between mid-December through mid-February. Starting at the fourth year of growth, during the dormant season (winter), prune out between 1/4 and 1/5 of all the older canes (branches). This will help increase new growth and continued production of fruit. Blueberry plants need a soil pH of between 4.0 to 5.5. If you do not know the acidity levels of the soil in your garden, check with your local agricultural extension office to have a soil test done. Fertilize the misty blueberry plants during April, June, August and October. For the first year, use 1/2 oz. of a special fertilizer made just for blueberries. Or you can use one that is for camellias and azaleas. Spread the fertilizer 2 feet in diameter around each misty blueberry plant.